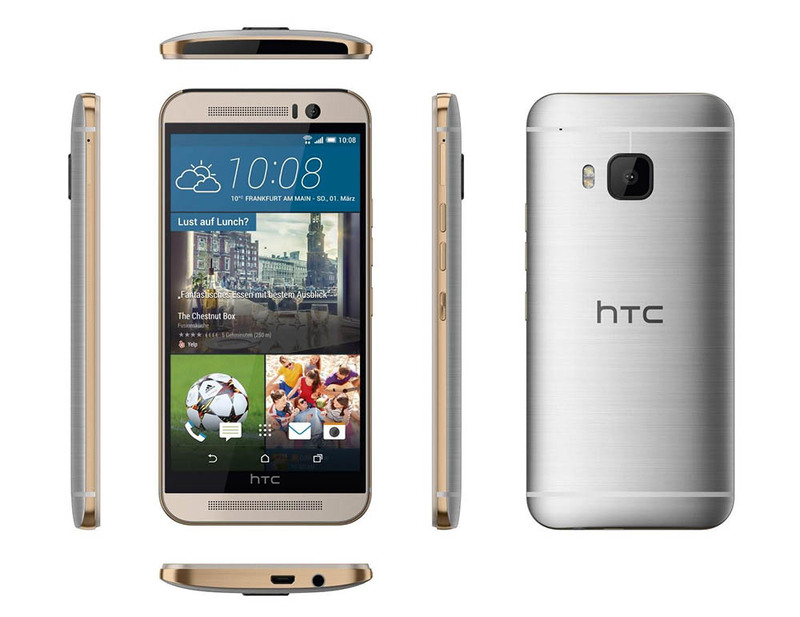 HTC announced the One M9 this morning at a press conference in Barcelona, Spain. There were no surprises, thanks to leaks, but that doesn’t mean the phone won’t be good. Sure, it looks like last year’s One (M8). Maybe that’s not a terrible thing, though? After all, the M8 is a very pretty, well-made phone. I guess we’ll find out once we spend some quality time with it, which should happen in March. 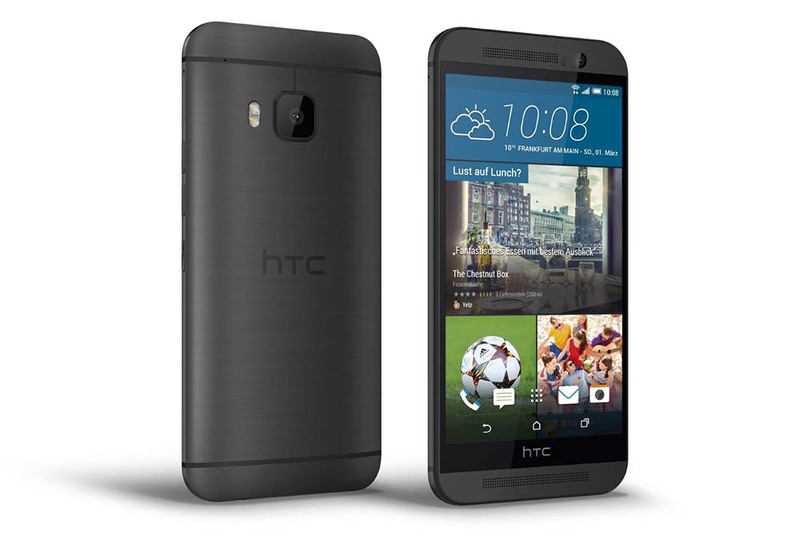 The HTC One M9 sports a 5-inch 1080p LCD3 display, all-metal body, Qualcomm Snapdragon 810 octa-core processor, 3GB RAM, 2,840mAh battery, 32GB internal storage, micro SD slot for expansion up to 128GB, 20MP rear camera (no optical image stabilization), 4 UltraPixel front camera, Android 5.0 “Lollipop,” front-facing BoomSound speakers, and comes in four color schemes, gold, silver, gold/silver, and gunmetal grey. The power button now joins the volume rocker on the right side of the device, but everything else, like the IR blaster, micro USB port, and headphone jack all match the locations they had on the M8. The new HTC One will be available in the U.S. on AT&T, Sprint, T-Mobile and Verizon early Spring, according to a press release. It will also be available through HTC.com, Amazon, Best Buy, Best Buy Mobile specialty stores, Costco Wholesale and Target. An unlocked version will be available at some point through HTC.com. 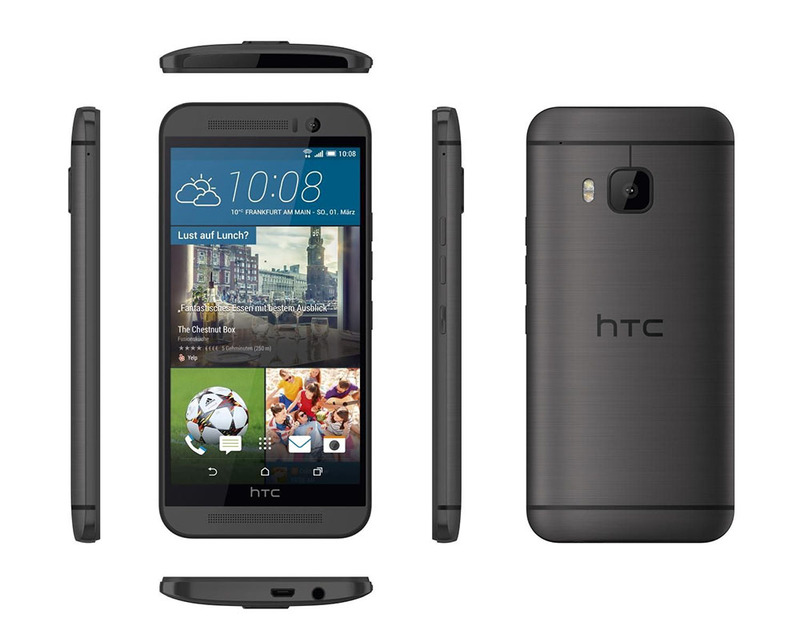 BARCELONA, Spain, March 1, 2015 /PRNewswire/ — Mobile World Congress — HTC today unveiled its most personal, beautiful and powerful smartphone yet, the HTC One M9. The newest flagship in the globally acclaimed HTC One family, the HTC One M9 is a classic yet timeless celebration of beauty and elegance that combines high style and performance, enabling you to get the most from your mobile phone. Building on a three-year pursuit of excellence, the HTC One M9 melds the best of the award-winning HTC One M7 and HTC One M8 into a stunning, iconic design. Distinct metal edges combine perfectly with graceful curves for a jewellery-grade look. Small and easy to hold, the crafted, all-metal unibody design is highlighted by an exquisite dual-tone silver and rose gold¹ finish that is as distinctive, as it is durable. Mirror-polished gold sides cascade effortlessly into a hairline brushed silver back panel, encasing a bright and vivid display. Your phone should make a statement about who you are, and the new HTC Sense™ 7 experience puts you in control of everything. Highly customizable and intuitively you, Themes puts you at the center of the smartphone experience, intelligently analyzing your favorite photos to modify the look and feel of your apps, color scheme and backgrounds. As your always-on travel companion, your smartphone is perfectly placed to enrich your mobile life. Sense 7 reinvents the home screen to deliver the most useful apps to the homepage based on your location. Whether at home, work, or play, you’re never more than a click away from the features you need with this contextual, customizable widget. A more intelligent HTC BlinkFeed™ also makes it easier to uncover the hidden gems that surround you by using location data to recommend points of interest, news and information. With the best camera being the one you carry in your pocket, your smartphone should make it a breeze to take brilliant, creative and fun images. The HTC One M9’s cameras are designed to capture every moment in amazing quality, allowing you to relive those moments again and again. The main camera features an incredible 20 megapixels that accentuate every crisp, intricate detail, and a sapphire cover lens that protects from scratches. For vivid video that looks like the latest blockbuster, the camera also shoots movies in 4K resolution. The best moments take you by surprise, and spontaneity often doesn’t come fully lit. The ultimate companion of the impulsive snapper, the HTC One M9 addresses low-light shots with a powerful UltraPixel™ front-facing camera. Dynamic auto exposure and UltraPixels that capture 300% more light than standard cameras deliver sharper, more natural and balanced self-portraits in any lighting conditions. HTC Sense 7 with HTC’s EYE™ Experience software makes taking creative pictures easy. A host of new editing effects including Shapes, Prismatic, Elements and Bokeh allow you to add a little bit of individual artistry into every shot, with the Zoe™ app automatically editing them, putting them to your choice of music² and letting friends remix the collection with their own shots to create a shared celebration from every moment. With so many incredible images, quickly showing your friends those brilliant shots could become an issue. Wherever they’re stored, the new One Gallery makes it easy to search through your entire photo library, viewing images saved on the phone, on social media and on select cloud platforms. The gallery puts your whole image library at your fingertips, searching by date, location, event, album or even the images themselves with Image Match. A truly great viewing experience deserves sound that puts you on the front row. The HTC One M9 guarantees a larger-than-life soundtrack courtesy of HTC BoomSound™. The HTC One family’s iconic dual front-facing speakers, now combined with 5.1 channel Dolby® Surround sound3 simulation, get you even closer to the action, delivering extraordinary, cinema-style surround sound. Uniting HTC BoomSound and Dolby Audio™ creates immersion vibrant audio experience, so you can enjoy movies with rich, clear and powerful sound even without connecting headphones or external speakers. Whether listening via the stereo speakers or headphones, even the most discerning music fans will be blown away by the phone’s support for perfect, 24-bit high-definition sound that surpasses even CD quality. HTC’s unique combination of HTC BoomSound, Dolby Audio™, a finely tuned sound profile, and Qualcomm® Immersive Audio gives all of your music and movies an unmistakable HTC One M9 flavor. Smartphones are fast becoming the central hub for home entertainment, and HTC Connect™ makes it easy to enjoy your multimedia experience beyond your phone. A three-finger swipe on the screen connects the phone to compatible TVs or external speakers from leading manufacturers including Harman Kardon. HTC Connect’s integration with Qualcomm® AllPlay™ smart media platform and Blackfire Research™ wireless media technology, allows you and your friends to stream high-quality content from your smartphones to multiple home entertainment devices around the house. The playlist feature also allows multiple smartphones to share a speaker with Qualcomm AllPlay. For the ultimate connected smartphone-powered TV experience, the HTC One M9 comes exclusively preloaded with the Peel® Smart Remote app. Instantly connecting you to the shows you love, the app even learns from your viewing habits, transforming your phone into a personal TV guide and remote control. For a standout look, the HTC One M9 will be available with a range of unique and customizable accessories including the second-generation HTC Dot View case, which adds more retro personalization thanks to a host of new features and color options. A transparent back keeps your smartphone pristine without hiding it from the world with the case injecting fun into even the most tedious commute by transforming into a mini games arcade. The new HTC Dot View case won’t even get in the way of apps such as Instagram, Snapchat and Badoo with through-the-case notifications alerting you to the latest photos, messages and check-ins. Life has no limits, and when your adventurous side takes you into the unknown, an IP68 water-resistant Active Case and Active Headset means that your phone can boldly follow wherever the action takes you, keeping up with the pace of the most epic adventures. The new HTC One will be available in the U.S. on AT&T, Sprint, T-Mobile and Verizon early Spring. It will also be available through HTC.com, Amazon, Best Buy, Best Buy Mobile specialty stores, Costco Wholesale and Target. An unlocked version will be available on www.htc.com. More information on availability will be shared in the coming weeks. Follow @HTCUSA and visit www.htc.com/one for more information.